Comscore is an American company that provides marketing data and analytics to many companies. Specially providing data for the digital world . It provides you those data that people navigate in your site. Founded in 1999 by Magid Abraham. It transforms the navigation data into insights and action. They have various types of tools. Tools for audience analytics, advertising analytics, digital business analytics and for mobile operator analysis. Gives your targeted audience and describe how they are engaged. Did your advertisement complete its goal. How you can buy the best media advertisement at best rates. How to increases your performance than your competitor. Don't Miss - 5 Examples for optimization of buttons to increase conversion rate. You get lots of information from Google Analytics but do you know why they did not subscribe you and purchase anything if you are selling some products. So to know that what visitors do on your website, you must use crazyegg tools. They have various tools like heatmap tool, A scroll map tool, An overlay tool, A confetti tool. It is all about visualizing your visitors. Crazyegg is a great web tracking tool. Their heatmap tool shows where visitors clicked. It shows which part of your website is most converting. It shows why your visitors do not convert. How many clicks you got on each element of the page. It shows you how far people are scrolling your webpage . Gives you detail report on all the clicks you got on your site. Clicktale provides customer experience analytics. Best web tracking tool for heatmap. It shows you, mouse move heatmap and click heatmap. Similar like crazyegg and very helpful to maximize your conversion rate. The mouse move heatmap tool shows the movement of the mouse. Click heatmap tool shows where your visitors clicked. Tips to improve user experience from analytics. Whatusersdo is for an online testing purpose and user experience research website. As the name itself says that what users do. It allows you to watch your website from a user perspective. Through this you can better watch what people are liking and doing in your website. Very useful to improve performance and conversion rates. How to improve communication with users. What they search on your website. What visitor thinks of your website. Usertesting is another great web tracking tool, allows you to observe your users and especially for usability testing. Various popular websites are using their services. You can watch screen activity. You can also listen to the user's voice. Gives you feedback from users. 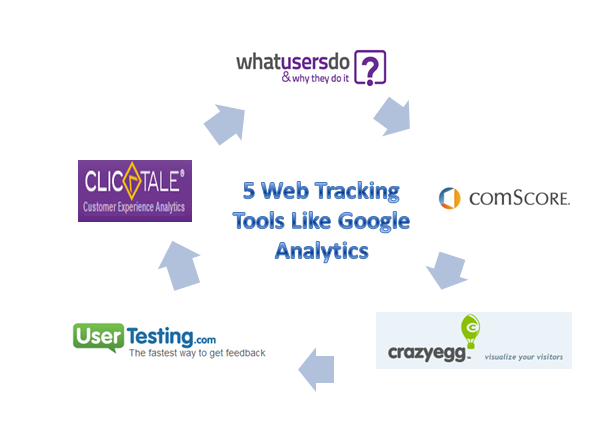 So these were the top 5 web tracking tools like google analytics for better analysis of your website and to increase performance and conversion rate. Description : 5 web tracking tools like google analytics for better optimization of your website and to track what users are searching and doing in your website or blog.